Performers include: Phil Silvers, Allan Melvin, Harvey Lembeck, Paul Ford, Maurice Gosfield, Billy Sands, Herbie Faye, Jimmy Little, Bernard Fein, Mickey Freeman, Maurice Brenner, Jack Healy, and Karl Lukas. Master Sergeant Ernest “Ernie” G. Bilko (Phil Silvers) runs the motor pool at the small Fort Baxter U.S. Army base in Kansas. Much to the frustration of Colonel John Hall (Paul Ford), Bilko spends most of his time operating get-rich quick schemes and cons like selling tank rides, leading poker games, and organizing horse race betting. 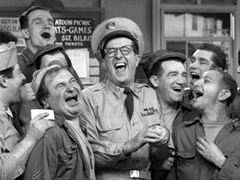 Working with Bilko are Corporals like fundraiser Rocco Barbella (Harvey Lembeck), reluctant family man Sam Fender (Herbie Faye), and organizer Steve Henshaw (Allan Melvin). Others include Privates like handsome Claude Dillingham (Walter Cartier), slobby Duane Doberman (Maurice Gosfield), Irving Fleischman (Maurice Brenner), “Stash” Kadowski (Karl Lukas), blabbermouth Dino Paparelli (Billy Sands), and diminutive Fielding Zimmerman (Mickey Freeman). Bilko sometimes dated Sgt. Joan Hogan (Elizabeth Fraser). The series was originally called You’ll Never Get Rich and is sometimes referred to as Sergeant Bilko or simply Bilko in reruns. The animated series Top Cat is loosely based on this program.